Welcome in the Farmhouse Al Pescheto. In the Venice lagoon a natural oasis, the destination of lovers of nature, beach and some good local products, in this paradise is located Al Pescheto an oasis a few steps from Venice and the liveliest Jesolo. A small house a few steps from one of the best beaches of northern Italy and a great starting point for a cultural day out in beautiful Venice or a night movida in Jesolo, then return in the Treporti paradise and enjoy the sunset over the lagoon of Venice. 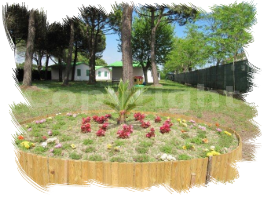 Surrounded by a beautiful garden of flowers and trees pescho relishes a good sea air and lagoon where a short distance there are the beautiful beaches of Jesolo and Treporti. The 'farm offers its customers bunglow nicely furnished, equipped with various amenities. Mirko and Manuela, are available to give you any useful information for your stay. Make your vacation unforgettable is our philosophy.